This conservation resource was created by Jean-Benoit Gagné and Tristan Clermont. Populations of wild deer in the Great Lakes states are quite large due to feeding and the lack of natural predators. Illinois, Michigan and Wisconsin are good destinations for recreational hunters where hunting is used as one of the means for population control. Deer can be a nuisance in certain areas as they sometimes overgraze and prevent the regeneration of natural vegetation or urban residents’ ornamentals. This close contact between deer and humans can be harmful to both human and the deer. An enhanced presence of deer in urban area is dangerous for car accidents, possible attack or could even attract some larger predators. Also, feeding these animals can be a serious threat for them; the Chronic Wasting Disease (CWD), a fatal neurological disease, can be transmitted more easily through common deer feeding at the same source. Biologists are worried because the number of cases is increasing over the years, and the disease has the potential to spread very easily. Fortunately, laws have been implemented in the mentioned states to prevent this possible threat. In the ‘’wild’’, feeding is usually used by hunters to keep deer in good shape and fat enough through winter to deliver greater amounts of meat and ensure a stable population of deer in an accessible area. They usually pour grain mixes at certain spots. Despite the many benefits for hunters, this practice also has some downsides, such as an increased risk for deer to develop acidosis. The typical deer present in urban settings of eastern North America is the white-tailed deer (Odocoileua virginianus). It is a member of the Cervidae family with the mule deer (from western North America), the elk and the moose for example. They have reddish-gray fur in the summer and greyish-brown in the winter. They change colour to hide in the surroundings. They are easily recognized by the white underside of their tail. Males have antlers that they shed in the late fall and grow new ones in the spring. They are considered medium sized mammals, males weighing around 175 pounds (80 kilograms) and females 120 pounds (55 kilograms). They are herbivorous and feed on flowers, trees buds, bark, legumes and grasses. The male tends to be call a ‘’buck’’ and the female, a fawn. A journal article from 1991 describe people feeding deer. Huge amount of money was spent by the man interviewed: about 200$ in corn every month during winter time. The guy, uninformed about the wrong he was doing to deer and the plant community, does it as an act of kindness: "They're hungry," he explained. "There's nothing here for them to eat. Someone's got to help them or they'll die. 23 years after, the situation is still the same in some rural regions of Québec where people still not believe they do wrong to the deer by feeding them. Some don’t understand that woods will support a natural population through winter without the help of people. Some winters might be harder than others but food availability will naturally keep the population down at a sustainable level for the environment. People, in a selfish way, like to watch wildlife as close as possible. It is easy to find videos of people getting attacked by wildlife or disturbing it with their close proximity. 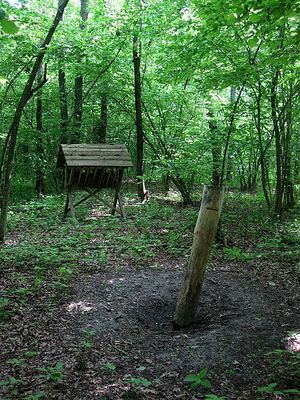 For example, some residents of rural areas in Québec have set artificial feeders to watch the wild deer. The Chronic Wasting Disease (CWD) is a transmissible spongiform encephalopathy. It is a disease that is spread out throughout US states and most central and eastern provinces of Canada and dangerous through the populations of mule, white-tailed deer and elk. It attacks the brain and is a progressive, fatal and degenerative disease.The disease is transmitted through body fluids and close contacts and scientifics agree that it occurs more often when there is a big number of individuals gathering near man-made supply. This is why feeding deer in urban area increases a lot the probability of the disease to spread. However, the scientists haven’t find any evidence that it could be transmitted to human. People shouldn’t be worried but should still be careful and retain from eating sick deer meat. The CWD is not the only transmissible disease benefiting from the proximity of deer at those sites. Parasites, virus and bacterias can cause other diseases, like the well-known Lyme disease. Outbreaks are more likely to occur where concentration of deer is higher than usual. Around a feeding site, excrements and urine are more abundant and excellent vectors of diseases. Unfortunately, some can be transmitted to humans and cause serious diseases. The Lyme disease in eastern US, Ontario and Québec is expanding and more and more people get sick every year. One of the solution proposed is to reduce the deer population as the disease is hosted in deer and transmitted to human when the tick bits a human after biting an infected deer. Large quantities of foods like hay, grains, corn and alfalfa is too high in carbohydrates for deer winter diet. Because winter food like twigs, buds and bark has very low nutritive value, their digestive system is adapted to be able to digest them. Therefore, they will develop acidosis or enterotoxaemia when exposed to rich food. Both can have similar symptoms like diarrhea, disorientation, dehydration resulting in a very rapid death of deer still in good physical shape. Deer’s necropsy shows, for both, large accumulation of starch in the rumen and intestines. Acidosis: It is the result of a radical change in the deer’s diet from a high fiber woody browse to low fiber high carbohydrate foods diet. Change in intestinal flora populations increases levels of lactic acid and lactate in the rumen, causing fluids to be diverted into it and ultimately the dehydration of the deer. The name comes from buildup of lactic acid in the rumen. Enterotoxaemia: Similar to acidosis, enterotoxaemia is a fast death for deer as bacteria naturally present in the lower intestine proliferate and secretes lethal concentrations of toxins. Since deer are unable to metabolize such an amount of grains during the winter time, they end up going all the way to the lower intestine at the advantage of the bacteria population. A big crowd of deer concentrated in a particular area could attract their predators near urban areas. Even if predators usually stay away from human presence, an excessive number of deer in area could attract them because they represent easy preys. 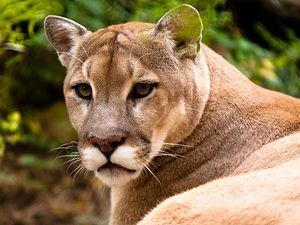 Some cases of cougar have been noticed around some cities and people are worried. There is no way to relocate big predators as they are usually territorial and could not establish somewhere else. Car accidents indirectly related to deer feeding is a big deal in a lot of cities. First, deer get acclimated to human and don’t show sign of fear. Also, the fact that they are over-crowded increase the probability of accidents. This is why a study stated that in the whole country of U.S.A., deer-vehicle collisions have been estimated to cause 29,000 injuries, 200 human fatalities, and over $1 billion dollars in property damage annually. In the winter time, deer’s food is less available and, hungry, they will feed on any comestible plant they can find. End of the winter is the most critical moment for vegetation damages by deer. In fact, a single deer can eat by himself 5 to 10 pounds of forage depending on exactly when it is. An unbalance number of deer on a territory can create a lot of damage not only to the vegetation and diversity of the area but also on the other fauna that try to co-exist in the ecosystem. They can have negative impacts on a lot of plant communities or some species and destroy the relation they have in the existing ecosystem. On the same idea, animals too are being negatively impacted. For example, a study stated found that some birds species we not observed anymore in area with more than 20 deer\square mile. In close proximity to urban feeders, where deer tend to concentrate, they have been seen to damage cedar hedges. The biggest reason that attract deer in urban area area is the accessibility of the food. Often citizens or even companies will feed the deer for different reasons. The reality is that feeding the deer is bad for everyone. There is some strategies that can help to stop feeding the deer. The biggest part would be to convince the citizens to stop doing by letting them know It is bad. Even if feeding the deer is illegal im a lot of states lot of people still do it, but teaching them by awareness campaign or just by local media could change people’s mind about this big issue. A second option would be to put higher fine for people that violate the law and lower the tolerance. For example in New-York, people can get up to 250$ of fine and even some jail time for an offense. Also even if people stop feeding the deer, deer still feed themselves in the gardens and in some other area with appropriate vegetation. Building fences can be a great strategy to stop the deer from eating in those urban place. In general the best scenario would be that everyone would take adequate measures to restrain access to your garden or any attractive comestible plants around your house. ↑ Chabot, D-M. (2014) Nourrir les cerfs sauvages l'hiver, une pratique néfaste. Radio-Canada. Retrieved from http://ici.radio-canada.ca/nouvelle/648074/cerfs-site-nourrissage-probleme-hiver. ↑ Kugeler, K. J., Jordan, R. A., Schulze, T. L., Griffith, K. S., & Mead, P. S. (2015). Will Culling White‐Tailed Deer Prevent Lyme Disease?. Zoonoses and public health.